shine brite zamorano: 4th grade Art Exhibit at Viva Pops! 4th grade Art Exhibit at Viva Pops! Select 4th grade students will have their art on exhibit at a local business called Viva Pops. 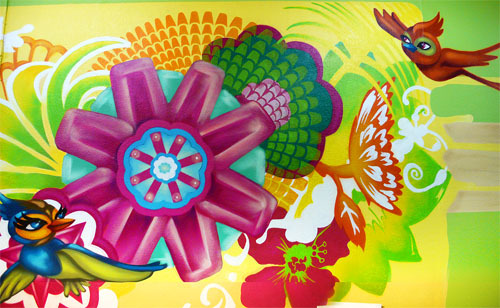 Their artwork is inspired by a mural that takes up an entire wall at this store of delicious homemade popsicles. I wrote about the project in an earlier post. There will be an opening reception for the show this Friday, March 25, from 5-7 pm. The students selected for the exhibit will be treated to a free pop at the event! A part of the proceeds from any sales of pops to family and friends at the reception will go back to Zamorano to help support our art program. Hope to see you there! Come out to support our students and school at this special event! Artist Isaias Crow will be there to talk about his mural and talk to the kids.